I had some time on my hands today so I made a Coconut Pastry Cream Boston Cream Pie. 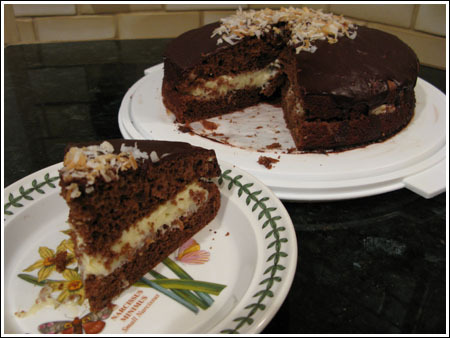 It’s like a Boston Cream Pie, but the filling is made with coconut milk and the cake is a soft chocolate sponge cake. If you try it, let me know. The recipe is so long that I almost feel guilty posting it. Whisk the egg yolks in a bowl and set it by the stove. Mix the cornstarch and sugar together in another bowl and set next to the stove. Combine the coconut milk, milk and cream in a saucepan and heat over medium until very hot. Pour some of the hot milk mixture into the sugar mixture and whisk until smooth. Pour in remaining milk mixture and whisk until smooth, then transfer all milk mixture back to saucepan, keeping it over medium heat. Whisk about ¼ cup of milk mixture into the egg yolks, then add yolk mixture back to the saucepan, whisking constantly, until mixture (it will be thick) comes to a full boil. Remove from heat and stir in vanilla. Pour into a clean bowl and cover with a sheet of waxed paper. Let cool slightly, then refrigerate until ready to use. Whisk the cocoa powder and coffee together until smooth; set aside. Mix together the cake flour, baking powder, baking soda and salt; set aside. Separate eggs and put yolks in one mixing bowl and whites in a second mixing bowl. Whisk about half of the sugar (reserve remaining), oil, and vanilla into the yolks. Whisk in the cocoa mixture, then add the flour mixture and whisk until smooth. Add cream of tartar to egg whites and beat with a hand-held electric mixer until soft peaks form. Beat in the remaining sugar until mixture becomes thick and glossy. Fold egg whites into the chocolate batter. Pour into pan and bake 25 minutes or until a toothpick inserted in center comes out clean. Let cool. Remove from pan and slice horizontally through center. Spread custard on top and cap with top. Make glaze. Melt butter in a small saucepan over medium heat. Add chocolate and reduce heat to low. Slowly stir in cream. Remove from heat and stir in vanilla, then add powdered sugar and whisk until smooth. Let it cool a bit before pouring over the cake. I now believe in love at first sight. Sounds super delicious!! I love coconut and I love chocolate. How clever to pair the two together in the Boston Cream Pie-esque dessert. Deeeelish. Rina, Todd loved it. The sponge could have been a little moister, but that’s an easy fix. And it was still good with the pastry cream. The only problem with cake baking is I’m stuck with all these cakes. I need to do mini versions, but the big versions are more fun. It looks gorgeous and worth the extra time! Oh my gosh, does that sound good. You made really good use of your time! The Boston Cream Pie looks spectacular! I have cinnamon rolls in the oven as I type. It smells sooooo good!! You had way too much time on your hands, but this looks very tasty. I’ll save this recipe for future use. I am with you on that one…..Did a different variation on Boston Cream Pie for a contest…long but not too difficult! I will be trying this recipe!